To nutrition for better superior engergy .Yaad enriches the brain with its vital herbs. It makes kids sharper and enhances their mental energy to take on the challenges at school. It also improves their grasping power, concentration and learning capacities, boosting their performance.Brahmi & Shankhpuspi Ext. These two herbal combined help to built up confidence, retention of memory etc. It also induces natural sleep.Ashwagandha Ext.This herb is a health promoter and helps to build up body resistant and stamina.Yasthimadhu Ext.:It?? ?s coughnashak and helps to removes chest congestion. 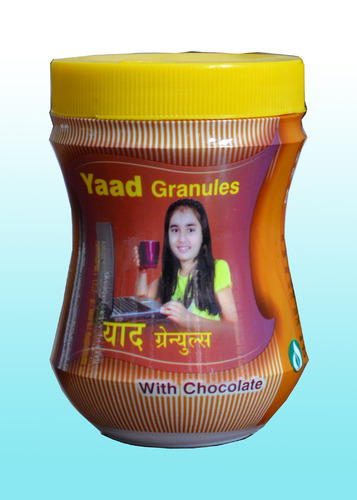 Coco & Chocolate Powder: Due to this base Yaad Granules enriches with superior test. Indications:Mental Retardation Psychiatric Problem In convulsions Insomnia Nervous Debility Dosage: Add 2 teaspoons of delicious chocolate flavoured Yaad to one cup of lukewarm milk. Works better when served twice daily. We "Dhanvantari" would like to introduce itself as a market leader in the realms of Traditional Ayurvedic & Herbal Medicines. We are a prominent manufacturer, supplier and exporter of Ayurvedic Herbal Medicines in the international market. The company promotes 27 Patent and 116 Generic ranges of Ayurvedic Products. With our vast experience and market expertise in the field, we have been able to establish ourselves as a reliable entity of the market.